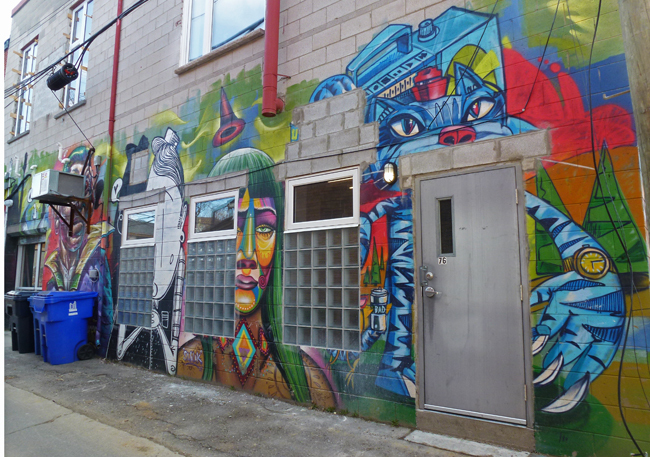 I spotted this mural along a laneway and at first thought it was intact but as you can see the mural has been infringed upon by several windows, doors and an air conditioner unit. It looks like several different artists each did a section such as the lady with the window in her face that was done by Shalak. I think there is one of the wee yellow birds by UB5000 behind another of the windows. I wish I had seen the whole thing before. I like this interrupted mural. The artists did a good job of wrapping the images around he various obstacles. Hello, cool mural. The artists did well working with the obstacles. Fine mural. I like the cat reaching around the door. The artist accounted for the door quite well. I think it's well done. There's a wall here with murals that have to work around windows. I've never photographed it. Are those womens faces behind the looking glass? Cool mural and it had to be a challenge for it to look this impressive. Love your title, Pat. A difficult mural to paint I would assume. Nice find Pat and thanks for contributing.